The twenty-first century has so far proven to be exciting and wondrous and filled with challenges we had never dreamed. New possibilities previously unimagined appear almost daily . 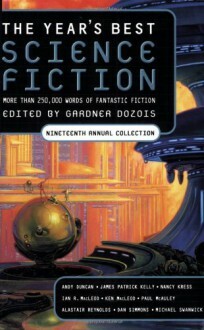 . . and science fiction stories continue to explore those possibilities with delightful results:Collected in this anthology are such compelling stories as:"On K2 with Kanakaredes" by Dan Simmons. A relentlessly paced and absorbing tale set in the near future about three mountain climbers who must scale the face of K2 with some very odd company. "The Human Front" by Ken MacLeod. In this compassionate coming-of-age tale the details of life are just a bit off from things as we know them-and nothing is as it appears to be. "Glacial" by Alastair Reynolds. A fascinating discovery on a distant planet leads to mass death and a wrenching mystery as spellbinding as anything in recent short fiction. The twenty-six stories in this collection imaginatively takes us far across the universe, into the very core of our beings, to the realm of the gods, and the moment just after now. Included here are the works of masters of the form and of bright new talents, including:Eleanor ArnasonChris BeckettMichael BlumleinMichael CassuttBrenda W. CloughPaul Di FilippoAndy DuncanCarolyn Ives GilmanJim GrimsleySimon IngsJames Patrick KellyLeigh KennedyNancy KressIan R. MacLeodKen MacLeodPaul J. McAuleyMaureen F. McHughRobert ReedAlastair ReynoldsGeoff RymanWilliam SandersDan SimmonsAllen M. SteeleCharles StrossMichael SwanwickHoward WaldropSupplementing the stories are the editor's insightful summation of the year's events and a lengthy list of honorable mentions, making this book a valuable resource in addition to serving as the single best place in the universe to find stories that stir the imagination and the heart.